Self-injury is increasingly becoming a recognized problem in youth ministry, and all youth pastors and volunteer staff (in Jr. High, High School, and College Ministries) need a general understanding of self-injury, signs to look out for, and what to do if they become aware that a pupil is self-injuring. People who self-injure can seem withdrawn or depressed. You may notice cuts or bruises that are always accompanied by excuses that don’t seem to fit. Many people who self-injure will cut their arms and so they may wear long sleeves, even when it is very hot. Within school pupils who self-injure may look for excuses not to have to wear shorts or short sleeves and therefore may avoid activities like PE or swimming. Particularly where younger children are concerned it is important to keep a close eye on especially vulnerable pupils such as those with a history of abuse. Learn about the difference between self-injury and suicide. If someone tells you they self-injure it means they trust you and are willing to share this very personal problem. Some people will just want to be heard and empathized with. Try not to push them by asking questions that may overwhelm them. Ensure that your youth ministry has a self-harm policy – guidelines for writing a policy and further information can be found by emailing us at cschaffner@fringeconversations.com. Anyone from any walk of life or any age can self-injure, including very young children.Self-injury affects people from all family backgrounds, religions, cultures and demographic groups. 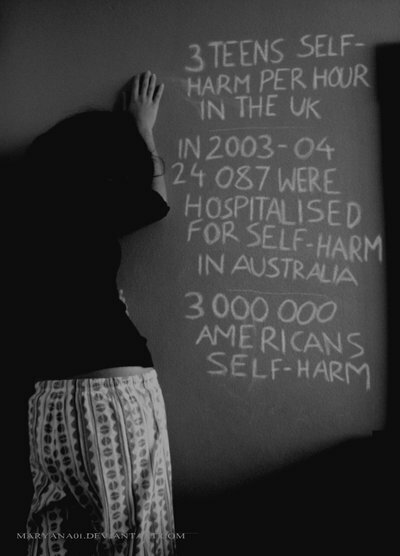 Self-injury affects both males and females. People who self-injure can often keep the problem to themselves for a very long time which means opening up to anyone about it can be difficult. You can’t just tell someone who self-injures to stop – it is not that easy.